"Kinch has written a new mini campaign!" I was very taken with Jeffs suggestion that we attempt to cobble campaigns together from the available scenarios in “Scenarios for All Ages”. You can find a catalogue of our efforts here. 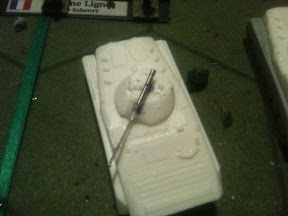 However, I was thinking that perhaps it might be better to attempt the same thing with the Tabletop Teasers that were so generously made available by Steve the Wargamer and Charles Grant on Steve Tabletop Teasers page. This would mean that we would have campaigns available that don’t rely on the player owning a book that currently out of print and is rather hard to get your hands on. You’ll find my effort below. It is as always a horse and musket treatment of the subject and I have quite deliberately stayed away from the more modern offerings and the Vikings. All of the scenarios needed can be found here. The war continues in Spain and two armies, one Allied, one French snake across the plains of La Mancha in a flurry of marching and counter-marching. This has continued for several weeks and both armies are beginning to reach the end the end of their endurance. Someone will have to strike a blow soon. The advance guards of both armies clash over control of strategic points. As this is the first armed encounter since the antagonists left winter quarters, the result here will have implications for the rest of the campaign. Lose here and crucial momentum will have been lost, which is very difficult to regain. Pride goeth before destruction and a haughty spirit before a fall. After the victory at the Guadiana, the pursuit was not as unrelenting as it should have been. The victor of scenario one is caught napping in his tents by a sudden counter-attack of the supposedly fleeing foe. As the retreat continues the army defeated in scenario one mounts a stern defence. This may blunt the attack of the advancing army and finally turn the tables. If the attacker wins this scenario, play scenario 4a. If the defender wins this scenario, play scenario 4b. With the enemy snapping at their heels, the retreating army takes refuge in the town of Borges. Summoning reinforcements, they hope to hold out long enough. With the advancing enemies momentum finally running out, the retreating army attempts to halt the attackers by mounting a defence in some difficult terrain. I'm going to try and play these (probably solo) using Command & Colours Napoleonics. In which case I'll be scoring the campaign with one point for a victory and two points for a crushing victory where the victor doubles the losers victory points. Thanks again to Jeff for coming up with the idea, Charles Grant for writing them in the first place and Steve for hosting them on his website. Spent a splendidly lazy day with Mrs Kinch today, our first full day together since her mother got ill. It was wonderful. 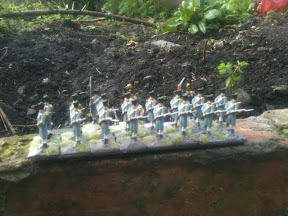 I did a spot of pottering, putting together a unit of Spanish light infantry (I took your advice Foy) and a little work on a book project. 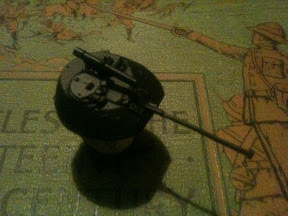 But lastly, I glued on the last of the ATGM mounts to my BMPs and started spraying. I rather cheated and looked up a Soviet armour tutorial on the Guild. I began the second part of the process, spraying the vehicles green - when I had to stop. My war games room is quite big and has a large window, but the Army painter spray is just too strong. Phew - a job for the morning when it's light out side. A package from Shaun at S&S arrived a few days ago and I finally managed to take time to do some work on them. There was a grab bag of stuff for Savage, Mr E and I. 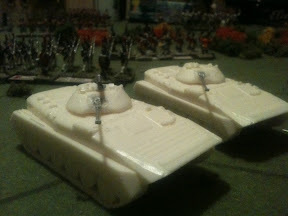 My part of the package was three BMP 2's for my Soviet Motor Rifle troops and a Spartan. This should allow me to field a platoon of jackbooted Soviets, which is plenty for Force on Force. As I write this in the kitchen, Mrs Kinch and Cousin Basil serenade me. They sing rather well. I haven't really worked with resin in nearly ten years, so I was a little anxious approaching them. I girded my craft knife and set to work. 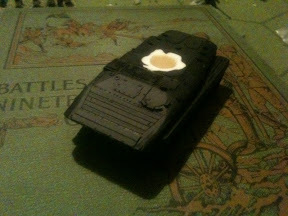 The castings cleaned up rather well, if I say so myself and should be ready to transport to Soviets any day now. Shaun's work is certainly up to snuff and certainly beats the alternative of wrestling with any of the plastic kits currently on the market. Mrs Kinch and Basil continue to sing. Mrs Kinch tells me that all men are the same and slaps Basil. For those of us in the cheap seats, the BMP 2 is the sequel to the BMP 1, a Soviet (I suppose I should say Russian now) armoured personnel carrier armed with a 30mm cannon and an AT-5 Spandrel antitank missile. It carries a squad of troops armed with Kalashnikovs, RPGs and a belief in the inevitable triumph of global Communism. The idea was these chaps could be conveyed through NATO artillery barrages, they would then dismount and murder the chaps in the regimental berets. This didn't work out so much in Afghanistisn*, so the tactic that they adopted was a thing called the "bonegruppa". The infantry would dismount several hundred yards from the objective and begin an assault on foot, while the BMP-2s would either as a blocking or a flanking force supporting the infantry. Mrs Kinch is a material girl apparently. Cousin Basil is curiously silent on the matter. We'll see how that works out on the tabletop. *This is when the Afghans were noble savages fighting global communism. 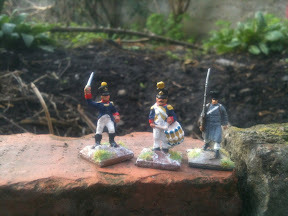 When I began my Napoleonic project many moons ago - I was rather intimidated by the number of figures required and the intricacy of painting demanded. With the eye to raising a large number of troops in short order, I picked up six boxes of HATs Young Guard. These are fairly innocuous looking fellows in great coats and shakos. The idea was that I would be able to paint these up without any of the facings or other flapdoodle required and I would have my French army relatively quickly. This was the case and they've stormed across many a shot torn tabletop, but in retrospect I'm a little unhappy that I went this route. Part of the attraction of the period is the sheer pagentry of the uniforms, the horses and so forth and while the grey ranks of the greatcoats are probably damn sight closer to the reality - they lack a certain something. I think the French have a word for it, but I don't know what it is. In many ways, I suppose it sums up my attitude to the French army of the period - a grey mass of stormtroopers. The hussars and the foreign legions add colour and I've plenty of Irish and Swiss troops in my French army. Which reminds me, I must add some Poles. The 39eme Ligne broke during the Combat of Foz de Arouce in 1811, during Massena's retreat from the Lines of Torres Verdras. They attempted to cross a river to their rear, but found the bridge blocked by French cavalry who were attempting to join the fight. Forced to ford the river, several soldiers drowned including the chap with the regiments eagle, which was lost. The eagle was later recovered by Portuguese peasents in return for a hefty sum and now sits in London. 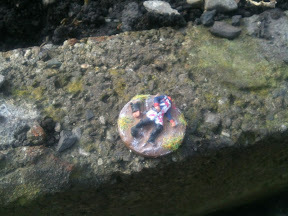 The casualty figure above is part of a collection of generic French casualty figures I bought from Mark Bevis a few years ago. I think they look rather well for an odd figure that he's taken a craft knife to. I think this chap started life as an Italeri French Infantry Standard Bearer. I should probably read some of the French memoirs of the period, which would probably make the Gallic juggernaut a little more human. 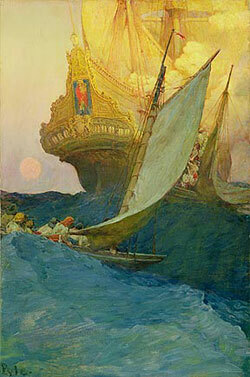 With Jim Duncan onboard, Joy and Forgetfulness has reached 100 followers. I can't say I ever say this happening. The blog was founded on 2nd of October, 2008 and has had 312 posts since then. Looking over the content, there haven't really been any significant themes, other than liking the Command & Colours games and having a yen for Napoleonics. Unless of course you count a fondness for bad jokes and 19th century verse. I don't post rules like Ross or scenarios like Donogh. The blog is mainly a collection of ramblings. But I've certainly enjoyed it and it appears others have to. I'm quite surprised that it has lasted this long to be honest, as I'm pretty poor at sustained effort as a general rule. But to celebrate this occasion, we're going to have a competition. The competition is open to followers (old or new) of this blog only. Please leave a comment below explaining why you read "Joy & Forgetfulness", a link to your favourite post and what you'd like to see some more of. The winner will be chosen by a secret process known only to the initiated, though truth me told there will most likely be some slips of paper and a hat involved. The prize is €25. This can either be sent directly to you by stuffing used readies in an envelope or by paypal or it can be in shape of war games goodies which I will order and send to you. The €25 does not include postage however. The closing date is the 28th of this month. Gentlemen, it's been a pleasure. I look forward to another four years, if the Lord spares us. Bluebear Jeff posted a very interesting challenge on his blog. The idea is to create a mini campaign using the scenarios in Scenarios for Wargamers. Steve, Ross and others have already posted their versions - so I think I shall have to try my hand at it. It's 1804 and a British expeditionary force has been landed to support a French Royalist uprising at Clochmerle. This has been, as is traditional, a complete disaster and the expeditionary force are marching to Nouvion, the nearest port which is being held by the Royal Navy, for the traditional evacuation. The campaign is made up of the following four scenarios. In this scenario, the pursuing French are catching up with the British who are attempting to hold them up before they manage to get into open country. In the event of a French victory play 2a. In the event of a British victory play 2b. The French having won the previous battle, have managed to keep the British on the run rather than just retreating. In this scenario they must keep on the pressure. 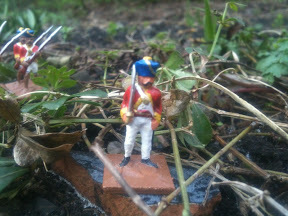 The redcoats have turned at bay and have ensconced themselves in a good defensive position. The French, assuming the British are whipped and rather than take the time to outflank the position, pile straight in. The British have arrived at their destination with the French hot on their heels. This scenario is a miniature sort of Corunna, so it's perfect. Carry the losses over from game to game. I would use the Grantian formula of a third dead, a third wounded and a third return to the Colours immediately. The wounded return to the Colours after a break of one game. The loser of the battle does not get his wounded figures back. Whoever wins Rear Guard, wins the campaign. John Curry has been performing trojan work over at the History of Wargaming Project Project and my copy of his latest publication arrived this week. It had been a pretty grim week and being able to lie on the couch and read something genuinely fascinating really gave me a lift in the old morale. This book covers a variety of different games, most of which do not involve toy soldiers. 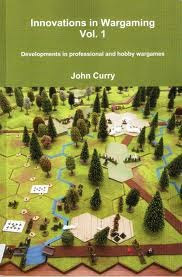 In brief, this is a cracking book, buy it, even if you never play any of the games from it - it is a good read and in terms of thinking about the hobby certainly has some of the most intellectually challenging stuff I've come across a long time. It is not often one gets a rush of that sort of new star enters his ken nonsense, but this book is full of it. Paddy Griffith who I had the honour to game with albeit by email and albeit briefly is a significant contributor to this book. Much like dealing with the man himself, reading his chapters are a fascinating if sometimes intellectually bruising experience. - Space Invaders on the Rhine. The only toy soldier game in the book covering hall games using 1/300 scale armour and presenting a Red Storm Rising style scenario. So very tempted by this. - Bob Cordery's essay on war games design. Engaging, readable and full of "Why didn't I think of that?" common sense. - Paddy Griffith's appendix on Historical Committee Games. More commonly known in my circle as LARPs, but probably some of the best writing about the mechanics of this sort of game that I've read. This includes a game set in China in 1927, which I hope to play soon. 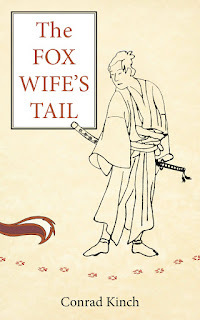 In fact the worst thing I can find to say about this book is that it isn't a looker by any stretch of the imagination. Brains to burn though. Quite simply stuffed with good things. I can't wait for the next volume. I asked the players of the Noli Illegitimos game of two weeks ago, if they'd be willing to give us the benefit of their thoughts on the game. Savage and The Admirable Deegan stepped into the breach. Another object lesson in the universal rule that all war is lack of information. Conrad got plenty of excecise conveying our grand strategies through the filters of both the possible and the probable, and it made for the best example of this game type I've yet seen. Even hours later myself and Mr E were comparing notes and discovering that neither of us had a firm grasp of what the elephant actually looked like. Looking forward to more of this sort of thing. "That naval Kriegspiel was really good fun to play. I think a big Kreigspiel (like that or the Waterloo game we played previously) could do with having the players' full attention, rather than running it in parallel with another game which might (if for no other reason than being physically there in front of us) grab a greater share of of our attention. I'm conscious that you were spending a lot of time backstage, keeping the game engine running and making it all look effortless, whereas in fact there is a lot of admin - meaning that if we weren't also playing other games you might worry that we'd have downtime between orders, waiting for you to come back. That "downtime worry" might be something that could be avoided by having more individualised objectives, whereby we would be jockeying for position within our faction as much as planning the downfall of the foreign foeman. In Saturday's game, for example, our turns could have taken us much longer (without being any less fun) if each of the three of us on the French side was trying to curry favour with the Directorate in separate ways. That's just one idea; I might dig out those rules and find out a little more about how the engine room operates, and chat with you again about it?" There's a disease which seems to afflict men in the fifties known as Lidl-itis. My father in law is a sufferer and I know of several others. Whenever they enter the confines a certain discount supermarket they see some tool or household device available and they leave with three. One to use, one to lend and one for "good wear." The problem that its not cheap if you didn't need it in the first place is one that doesn't seem to phase them. However, I shouldn't grouse too much - it does mean that my father in law is always willing to lend me tools. Also it would appear that I've become a fellow sufferer. I have no idea what I want a soldering iron for, I'm not even sure what I'd do with it, but it was on sale in the ubiqitous discount supermarket for €12 and I think I recall one being used in Donald Featherstone's Complete Book of Wargaming so I had to buy it. I was wondering if it would work for sticking metal figures together, but I'm reluctant to start mauling precious toy soldiers without any idea if it will work or not. Any suggestions as to what I can do with it? I have a copy of the above print that I picked up while we were honeymooning in London*. It was not long after that I got in contact with John Cunningham and a wonderful, if somewhat abusive, relationship developed. John is somehow responsible (I think Uwe may have had a hand in them as well) for the figures below and he will certainly sell you some, possibly whether you want them or not. I've wanted to mess about on the sub-continent for a while and for that sepoys were a necessity. 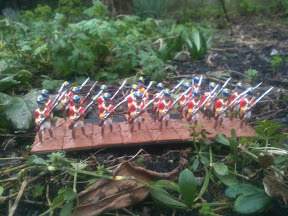 I got my first units of my Honourable East India Company troops a few weeks ago from Mark, who I think you'll agree did a nice job on them. John Company had relied on mercenaries for much of its history, but in the years after the battle of Plassey, they organised their independant companies of sepoys into the First Bengal Native Infantry. 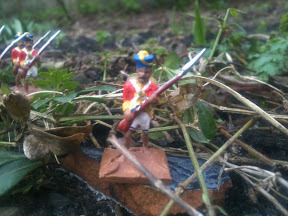 These chaps are slightly later and were raised to fight Uwe's Mysore troops. I haven't given much thought to how to rate these chaps, mainly because I haven't a mat for India yet. Might give some thought to that for my birthday. The Osprey on the subject "Armies of the East India Company 1750-1850" informs me that Indian units favoured brass shelled drums rather than the painted wood used by the British, as they were less susceptible to the depredations of insects. I presume that brass or wood, no self respecting drummer would be seen on parade unless his piece was resplendent in the facing colour of the regiment. I quite like this figure mainly because of his magnificent moustaches. I had contemplated using European officers, but firstly that was much a feature of the latter years of the Company's life and secondly, I've only met one Indian army officer. However, the chap I did meet was a such a ferocious looking character (he was a Sikh) that I thought I'd be a fool to deprive myself. This chap in his rather fetching shorts is a sepoy, an English corruption of the word Sipahi, which means soldier, at least that what the Encyclopaedia Britannica tells me. They will be taking the field against the Mad Rajah of Kala-Akaata whose forces grow stronger by the day. 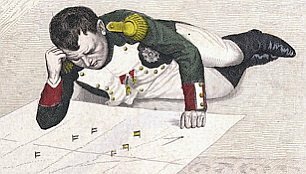 I will be using Command & Colours Napoleonics as they are my prefered set, though I'm still in two minds as to what tweaks will be necessary. 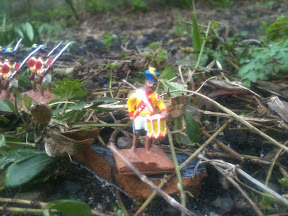 I have quite a collection of native soldiery, though its rather cavalry heavy, and three units of Sepoys. Coupled with my Napoleonic redcoats that should be sufficient for a small game at least. I'm beginning to think that this is something I should try sooner rather than later. *This decision has often been questioned. We chose it on the basis that we'd had drama quite enough in the run up to our wedding. Mrs Kinch and I have three criteria for a good holiday destination, a country must score two out of three to be considered. England ticks all the boxes as we speak the language, like the people and eat the food. We had a games day at Chez Kinch last week. Donogh brought Force on Force, Admiral Creanor brought the Fletcher Pratt naval wargame while the chaps gave my latest scenario a run over. In between all of this, I ran from room to room clutching Noli Illigitemos - a naval kreigspiel written by Paddy Griffith. Donogh's game was a series of small engagements in Ngorno Karabakh (I think that is how it is spelled) which went rather well, but which he will chronicle on his own blog. Admiral Creanor's Fletcher Pratt game which was a sort of reverse River Plate went well, though apparently ship identification was an issue. Noli ran well though I regret to say it was a bad campaign for the Royal Navy. They were dogged by ill luck and an uncharacteristically decisive French command. - the British fleet was concerned with keeping the French bottled in Toulon and also wanted to prevent an invasion of Corsica. - the French were to retake Corsica and support French armies in Italy as well as helping boot the Dons out of Perpingnon. This rather tall order was followed by a series of orders-counter orders and threats from Paris as the game progressed. The British began the campaign by instituting a close blockade of Toulon with a skeleton force while maintaining a looser blockade over the horizon. A frigate each was despatched to the Italian and Spanish fronts to raise hell along the coast line. Meanwhile a small squadron covered Corsica and a single frigate was sent too woo the Tuscan rulers of Elba. The French waited a while until the wind allowed them to venture out, covered by an early morning fog. This gave them the opportunity to engage the close blockade before they could be supported. The French headed for open sea hotly pursued by the British who lost them during the night. The British admirals were faced with a dilemma, whether to head for Corsica or whether to comb the open sea looking for the Fench. They adopted a compromise plan while the French looped south and headed back to Toulon. The British reorganised their fleet swiftly, despatching Nelson to circumnavigate Corsica at the head of a strong squadron, while the damaged vessels from the close blockading squadron were sent to Port Mahon for repairs. Meanwhile two sail from the Neapolitan navy had arrived and were kept at Corsica, while Nelson swept east in search of the elusive French. A British frigate was sent into Toulon to get a close look at what if anything was there. The British began to get rather worried when it did not return. The French on the other hand were of the opinion that an invasion of Corsica would be a very dicey proposition as they only had vessels to transport a quarter of the army. A successful invasion would involve loading soldiers on men of war, a forgiving wind and ensuring that the Royal Navy could be kept off the vulnerable transports. Sadly the French admirals arrived home in Toulon (pausing only to beat up the reduced blockading squadron) to outraged letters from Paris condemning their inaction and the demanding that something about the British fleet (actually a frigate) rampaging around the coast of Perpingnon. The French licked their wounds as best they could and waited for a good wind. They then broke out again, abandoning any hope of taking Corsica and setting out to put down the British fleet which was terrorising the French army's supply lines at Perpingnon. The British meanwhile, were frantically attempting to recall Nelson who had gone as far a field as Alexandria looking for the French. They also set out to find the French fleet and they managed to do so, but not before the French fleet had pummelled the solitary British frigate which had put in a very respectable innings up until now. 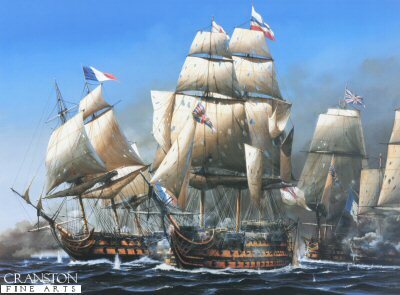 The British players looked at the balance of forces and felt that as they were outnumbered two to one in ships of the line, it would be madness to attempt to engage the French. They flew back to Toulon with the French fleet in hot pursuit. Meanwhile a British frigate had finally caught up with Nelson who was making best speed back to Toulon, however battle was joined before he arrived and the French fleet managed to maul the British before being mauled in their turn. The battle ended in a pyrrhic British victory, with seven French vessels being forced to strike. However, the British flag ship was literally shot to pieces and sunk. Surprisingly the British admiral survived this and was taken off on one of the 74s. However four Royal Navy ships were forced to strike and two of those were not recaptured. Not the sort of crushing victory the British public are used to and likely to end the careers of the admirals responsible. In conclusion, this was an enjoyable game and if my poor brain felt a little overloaded, I think I managed to keep all the balls in air without the players seeing behind the curtain too much. The Royal Navy were dogged by poor luck throughout, while the French were uncharacteristically decisive and lucky to avoid the poor weather that would have sunk some of their poorer sailors. - The dashed poor luck of the Frigate Excelsior, dis-masted by a lucky shot in Toulon harbour and taken. 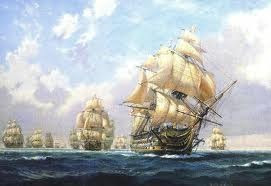 - The problems of the British command, many times they echoed Nelson's claim that if they were to die, "want of frigates" would be written on their hearts. - The instant response by the French to political pressure from Paris which led them on a strategic wild goose chase to Perpignon. - The drastic over estimation of the raiding effectiveness of the British frigates. - The pluck of the Luigi, a 74 of the Neapolitan navy, which fought every gun to the last an the battle of Toulon, standing where better crewed, better trained and better built ships either struck or were sent to the bottom. They were definately proof of General Du Gormand's diction, "better lucky than good." Definately a game I would run again. 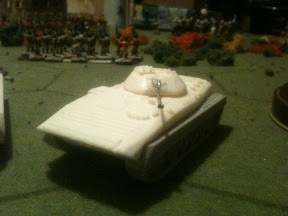 This post has nothing to wargaming. My grandmother died on Sunday - she was 93 years of age and left behind her five sons and a daughter, an imposture* of grandchildren and a circle of cousins and friends that was as wide as it was varied. She died peacefully, after a brief illness, after a life that was happy and full. She was laid out in her own home last night and several hundred people passed through the family home to see her. My wrist is aching from shaking hands and I am hoarse from talk. Gilbert and Sullivan wrote that whenever Death calls, he must call too soon - a sentiment that seems still seems to have common currency, unlike many of their themes. I was told by a family friend, a good woman who meant it sincerely, that my grand mothers death was tragic. It was not. We, her family, will miss her kindness, her strength and her legendary hospitality; but hers was not an end that was tragic. She died with her sons and daughter looking over her, amongst friends and with Christ in her heart. I have seen people die and I have seen people dead. Often these people are alone, sometimes unloved and often unmourned. They die young and they rarely die with their family by them. Sometimes they die in the knowledge that blood was shed in an everlasting covenant for them, sometimes not. On occasion there is only a public servant present to see to their remains. Children die and that is always unlooked for. That they die innocent is little consolation for us who remain behind. Our understanding is as limited as our vision. I am grateful for my grandmothers life. I am grateful that she had such a gentle quietus. I pray for her as well as those who are not so lucky. I pray for those who hold death so terrible that they cannot conceive of a good one. In life we are in the midst of death and I hope that if we can aspire to live a good life, we should also try to make a good end. My grandmother did both. I can think of no finer legacy. *that is the correct collective noun for a group of Kinchs. In print of course we are a libel of Kinchs. 1. Tidying up the war room - sorting figures into boxes is taking forever. Getting there slowly. Dear Lord I have a lot of French infantry. 2. Finished putting together and spraying a Bedford truck for my Cold War British. 3. Spraying and varnishing eight new sabot bases for my Napoleonic forces. 4. Assembling a 17th century gun for a scenario on Saturday. Smaller than I expected. I was hoping for something slightly more in the line of CS Forresters "The Gun". 5. I also sorted all my Indian forces. They come to two A4 boxes worth. This surprised me. No guns yet though. I must sort that out. 6. Sprayed my Imperial Guard Horse Grenadiers. I'm just going to have to bite the bullet, strip the bugler and get the unit out the door.